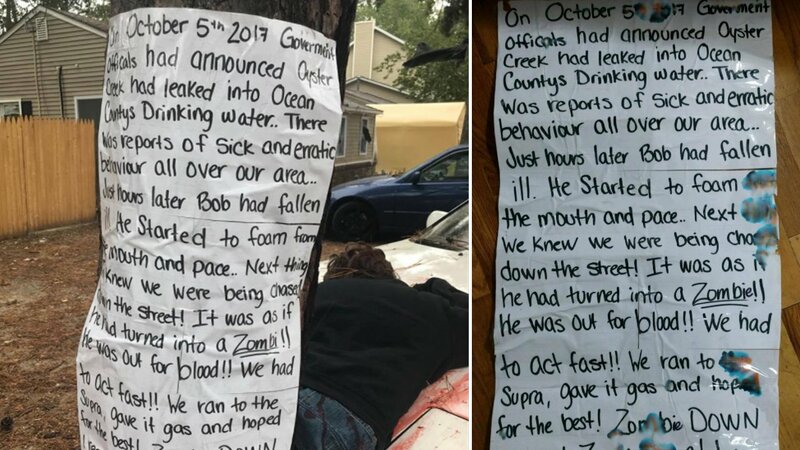 A couple's Halloween display featuring a bloody car hood and a dead body on their front lawn prompted police to swing by to ask them some questions. WARETOWN, New Jersey -- When Kevin and Krysten Negrotto began to decorate their Waretown, New Jersey home for Halloween, there was a car sitting in the side yard. "Instead of it being in the way, we turned it into the main attraction," Kevin said. When you first come upon it, it looks like a real crash scene with the vintage Toyota Supra rammed into a tree pinning a victim. Blood is splattered on the hood. Another victim is thrown several feet away, and the yard is surrounded by crime scene tape. People drive by and honk their horns with approval. "This is a bus stop. All the kids love it. They think it's great," Kevin said. But some think differently. "They think it's too real. Maybe it hits home too much for some people. And I get that, but it's Halloween. It's clearly fake," Kevin said. Then came the biggest trick-or-treat of all when the local police knocked on the door and not looking for candy. "They just said one of the neighbors didn't like it. They have to come out and let us know," Kevin said. The rest of Kevin and Krysten's yard is filled with more traditional Halloween decorations. Click here fore more stories and videos about Halloween.